In BEMapps.com – our marketing & sales dashboard – we have upgraded the Trends feature. 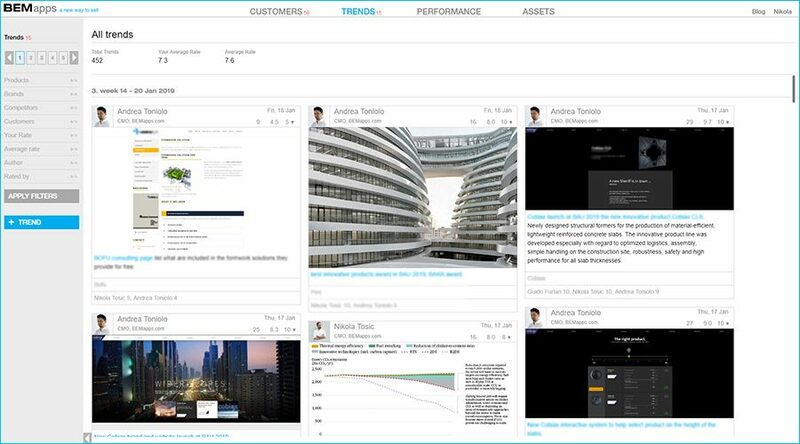 Trends feature allows all team members to add, view, manage, search, and rate trends. Trends include customer, competitor, brand, and product information. Trends, once tagged, create easy to access stories which allow members to quickly use the information. Trends feature improves company know-how and teamwork. The more it is used, the more all team members have equal and well developed knowledge and their activities will improve. Top rated trends are also emailed automatically to all members. – For the rest of the world: Nikola Tosic, nikola@bemapps.com. Team – Team performance and KPIs. Above features allow a complete overview of marketing and sales activities from operations to strategy, giving all team members a valuable insight and data. Current clients can log in and use the new Trends feature.